The leaves have turned brown around the holes and on the undersides are dry, brown "growths" that look like very tiny pine cones. It does not seem to affect the nearby hollies (yet?). What to do? Any help is appreciated. I believe this to be entoomosporium leaf spot. There is a treatment, but preventing it is the key. 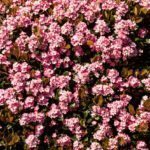 Here are a few links to help you decide a plan or if replacing the shrubs may be the best solution.